As a Filipino Catholic, I feel that something is missing when I couldn't attend a Sunday mass while I was in Thailand. There's a lot of Filipino Catholics in the place where I was staying but their mass is being held in a multi-purpose hall. There's nothing wrong in attending a Holy Mass in a multi-purpose hall but it can never beat the Holy Mass in a proper church. My Pinoy friends told me of a church that is just a bus ride away from our place. And so I discovered the Our Lady Mother of God Parish Church in Rangsit, Pathumthani. This church in Rangsit is just a simple one and relatively new compared to the Bangkok Cathedral and Kalawar Church. Its facade only have a simple cross and nothing else. The symbol depicting the Mother of God can be found at the top of the door. Rangsit Catholic Church was built after Vatican II so it is understandable why this church lack the grandiose of churches built during the Medieval Era or the Rennaisance Period or even later. The altar of this church is also a simple one. Good thing that the tabernacle was placed in the center. I felt at home in Rangsit Catholic Church because there are many Filipino parishioners. In fact, majority of the attendees in the English-language Mass are Filipinos. The lectors are Filipinos. The choir are composed by Filipinos. Even the priest is a Filipino. Attending a Sunday Mass in Rangsit Catholic Church is just like attending Sunday Mass at home. One thing that I like with this church is the availability of missals and prayer books at the pews. It is very helpful because parishioners can easily follow what's happening during Mass. I think that parish churches should also do this. There are many things that I like in Rangsit Catholic Church but the best one is the warmth of the Thai Catholics in parish. I noticed that there is a sort of division between Thai Catholics and their brethren from other countries due to language barrier. Thais have difficulty in speaking English that's why they don't mingle with the Filipino crowd. Despite of the language barrier, I manage to befriend a Thai in this parish. I appreciate the fact that my friend tried very hard to speak in English even though he can't construct even a simple sentence. He even introduced me to other Thai Catholics, young and old. I didn't know how it happened but I got a Thai friend in just a short time of attending Mass in that church. 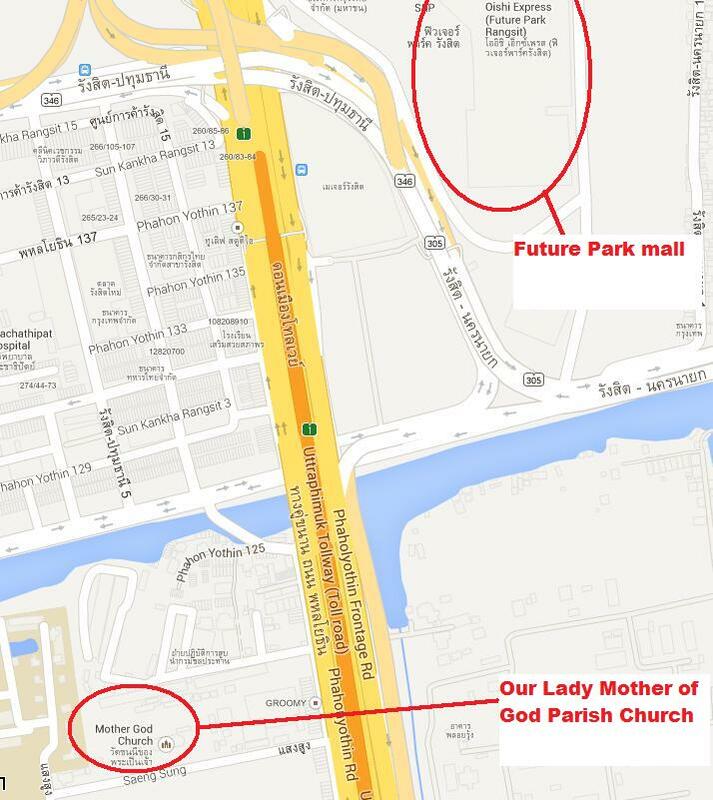 I am glad that I found the Our Lady Mother God Parish Church in Rangsit. I am glad that I found friends in both the Filipino community and Thai parishioners. I am glad that our Lord made me feel at home in His church in Rangsit. Take note that I never rode a taxi to reach this church. I just commuted using bus to reach Future Park mall and then waled to the church. 1. The first thing that you should do is to go to the Future Park. 2. You can walk to reach the church. 3. You can ride a motorcycle and tell the driver to take you to Bod Chris. I think that the fare is about 50 Baht. Just make sure that you turn right from Paholyothin Road when you the arch with a cross at the top (see image below). Holy Mass in English language is available during Sundays at 10:30 AM. Other masses are in Thai language. Thanks for the info. A bit far from my place but an added wealth of knowledge about Thai catholic churches. I attend Ruam Rudee because of accessibility but none of the parishioners are as friendly as you described in this church. I am glad you felt at home even when you were actually away from home. I heard about a church in Ruam Rudee. Is that the church that have an Indonesian priest (or was it Indian)? Yes I'm glad to have some friends from Rangsit church. Why don't you visit this church some times? This one looks more modern, like the ones here. Love the inside - very very nice! You're correct. This church is modern that's why it doesn't have the artistry that can be found in old churches. It's very nice and clean inside a. Do they have Tagalog mass too? There's no Tagalo mass in Rangsit Church. There is only one church that have Tagalog mass. That church is located in Bangkok. There's so many Filipinos in Singapore that it is not a surprise that there's Tagalog mass in the churches there. There's a regular English Tagalog Mass conducted by Father John Tamayo in a small Chapel inside the compound of the Skills Development Center for the Blind at 3 pm every Sunday. The center is located in Tiwanon-Pakkret Soi 1, otherwise known as Soi Pikan by the locals. It's walking distance from Hayaek Pakkret. Trying to get in contact with you but the email form doesn't seem to be going through. Is there anyway to perhaps contact you privately? Hi! Are you contacting the priest of this church?